The Second Darkness Adventure Path begins in the lawless city of Riddleport in western Varisia - a haven for pirates, bandits, criminals, and worse. Yet what lurks under Riddleport puts the city's thugs and thieves to shame. As the campaign progresses, you'll explore hostile cities, ancient ruins, caverns and dungeons, evil temples, hidden fortresses, eerie dimensions of shadows, and entire worlds hidden deep in the most dangerous regions of the Darklands themselves. 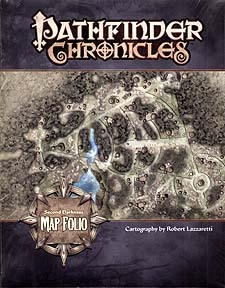 The Second Darkness Map Folio contains reprinted maps of all the key locations explored in Pathfinder's third Adventure Path. Even if you aren't running Second Darkness, the maps inside can serve as cities, dungeons, temples, and worlds for any RPG campaign. In addition, inside this folio you'll find a huge poster map of one of the most important sites the PCs will visit in the course of the campaign - the sprawling and decadent city of the drow: Zirnakaynin, Last Home of the Elves!